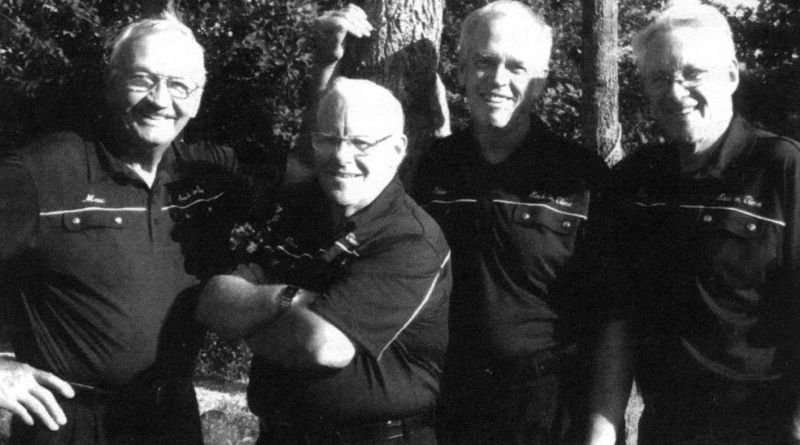 Sometime in May of 1982, four young men, who where members of London's Men Of Accord barbershop chorus, came together and formed a quartet and they called it Constellation (meaning an Array of Stars). 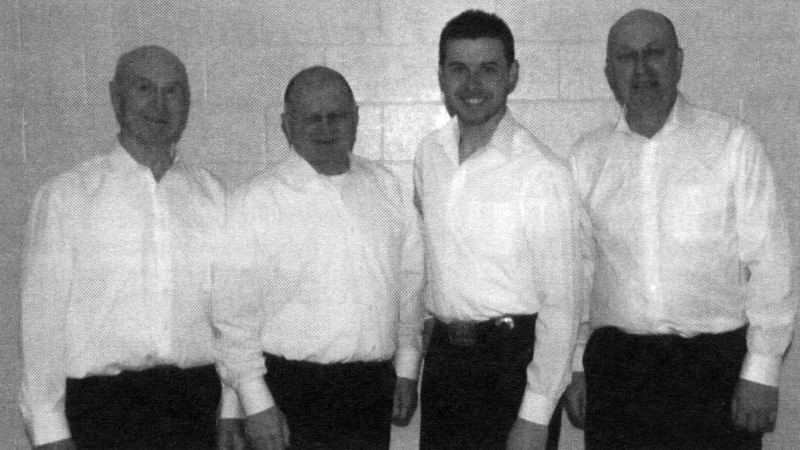 This was years before the inception of the Strathroy Vocal Federation, but because three of the men in this quartet played a big part in starting the Federation, this quartet deserves mention on this page. The following picture was taken of Constellation at the Spring Convention on April 22nd,1983, that was held at Hamilton Place in Hamilton, Ontario. From left to right is Howard Greenly (Tenor), Brian McDougall (Lead), Jim McDougall (BassI and John Gough (Baritone). They sang at many venues from Toronto to Sarnia over a period of about three years, and it was Brian, Jim and John who where implemental in forming the Strathroy Vocal Federation. Frank Knoll - tenor - 25 year Barbershop Harmony Society Member - Semi-retired Veterinarian - has been on the Strathroy Chapter Board of Directors since its inception - currently Western Division Co-ordinator for the Ontario District. John Gough - lead - 35 year Barbershop Harmony Society Member - owned and operated Novastar Genetics near Mt. Brydges - has been the Director of the Strathroy Chapter Chorus since its inception. Jim McDougall - bass - retired farmer who just loves to sing - 56 year Barbershop Harmony Society Member - founding president of the Strathroy Chapter and also a member of the London Chapter (Men of Accord) - served as Ontario District President 1993-1994 and served on the International Barbershop Harmony Society Board of Directors 1996. Wood Hustler - baritone - 14 year Barbershop Harmony Society Member with the London, Ont. Chapter and also a member of the Middlesex Centre Chapter (Forest City Fire) - retired Public School Principal - loves to sing and to entertain audiences. 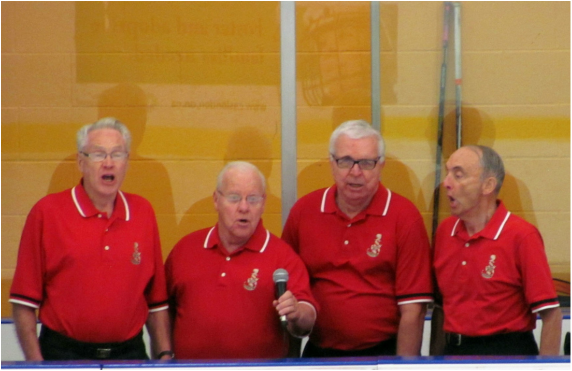 All four members of this quartet are members of the Strathroy Vocal Federation, and have been since its inception. These four gentlemen hit it off immediately when the Foundation was formed, and within months, Rural Roots was born. They proudly claim to be still having a blast together. Typically at practice they enjoy almost as much laughter as music and over their years together have built up an entertaining repertoire of over sixty pieces of music. From left to right is Ernie McEwen/Tenor, Bob Howlett/Lead, Craig Bycraft/Bass an Roswell McPherson/Baritone. Ernie McEwen, a 40 year founding member of the Strathroy Vocal Federation , has sadly passed away and Rural Routes has ceased to exist. In memorial to Ernie and all the good times he must have experienced throughout the years, while singing with Rural Routes and the Vocal Federation, and in memorial as well to the Rural Routes quartet and their numerous, entertaining performances that where enjoyed by so many, the above photo and writing will continue to exist at this location on our website. This quartet is not fully born out of the Strathroy Vocal Federation but they are most certainly related due to the lead singer's long time membership in the Federation. They are a veteran Barbershop Quartet dedicated to singing this style of music in an interesting and often comical fashion. Together they represent many years of barbershop experience. Peter O'Donnell/Bass, Ron Smith/Lead, Max Charlton/Baritone and Ron Madill/Tenor take great pleasure in ringing a chord and hope their performance will ring a chord with the audience. This quartet was put together for the purpose of singing one song for the Strathroy Vocal Federation's annual show in April of 2013. The show was entitled "Country Fair" and the song they sang was The Auctioneer that challenged their fast, tongue twisted vocal abilities and their performance was excellent to a level that gave them the championship at the previous, 2013 Novice Quartet Competition. They are, from left to right, Bob Fennel/Tenor, Terry Morley/Lead, Stewie Irvine/Bass and John Gough/Baritone. The Starthroy Vocal Federation has since been forced to bid farewell to Terry Morley who has moved to Alberta and taken a job as a Veterinarian, utilizing his skills in the breeding of horses. Terry loved barbershop singing and was monumental in bringing the above four men together to sing The Auctioneer. Both him and his wife Bobbi will be missed by the Federation and it is their hope that he find a chapter out there that he can sing with and that he stay in touch. The singing of valentines is a popular and enjoyable thing carried out by a number of Vocal Federation Chorus members every year on Valentines Day. For the price of $50, a group of well dressed men, like shown in the picture above, will go into residences and commercial venues and sing two love songs to your loved woman or man. From left to right in the picture, which was taken on Valentines Day in 2011, is John Gough (Baritone), Frank Knoll (Bass), Ron Smith (Lead), and Bob Fennell (Tenor). This group of men at that time formed a registered quartet that carried the name of "Act Your Age". On Valentines Day of 2013, the quartet known as For-tified Four pose with the recipient of a rose and two love songs sung to her by the quartet on behalf of her loved one. 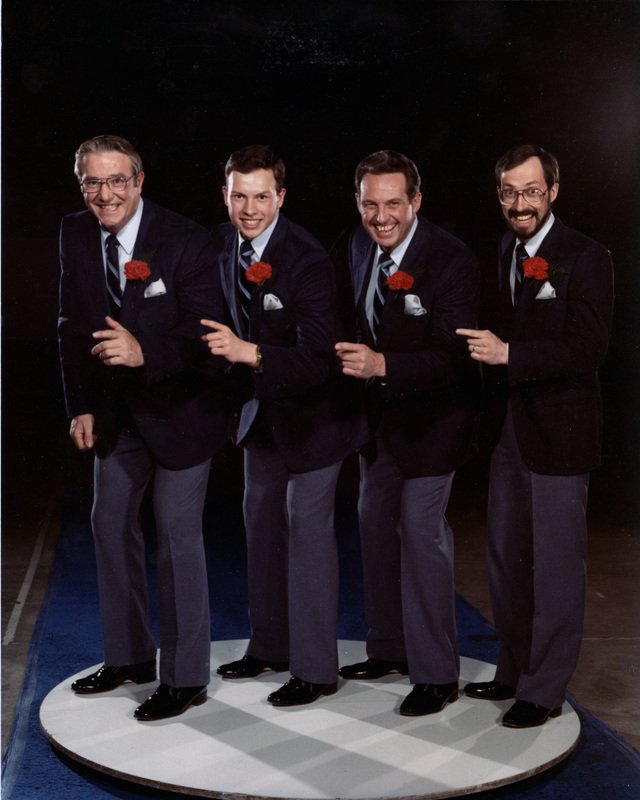 The quartet members are from left to right: Frank Knoll (Tenor), John Gough (Lead), Jim McDougall (bass) and Wood Hustler (baritone). On Valentines Day of 2013, the above quartet poses at the My FM radio station Strathroy at the beginning of their singing valentines day. 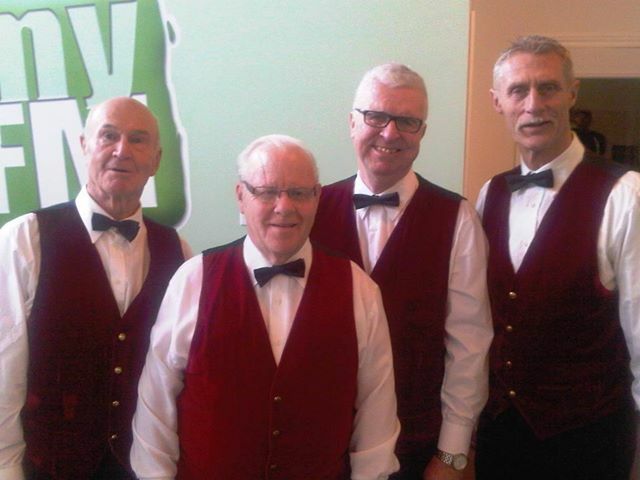 From left to right are Bob Fennell (Tenor), Ron Smith (Lead), Doug Morley (Bass) and Ken Vanderheyden (Baritone). The quartet featured in the video contains a former member of the Strathroy Vocal Federation by the name of Adrian Smith, who's father Dan Smith is presently an active member of the Federation. In the quartet below, called the Executives, Adrian is second from the left and is singing lead. Prior to The Executives, Adrian was implemental in starting up the well known, award winning quartet known as Shoptimus Prime. ​This quartet is about six months old as of Mid November of 2015. As seen below, they are singing the National Anthem from the penalty box at a hockey tournament game in Komoka, Ontario. From left to right they are Ron Madill (Tenor), Ron Smith (Lead), Doug Morley (Bass) and Roswell McPherson (Baritone). Last year (2015), these four gentlemen came together to form a quartet for the novice competition in London, and they called that quartet simply, Q4. Here they are seen at the 2016 novice competition in Sarnia as they sing the last chords of a song called Ride The Chariot. 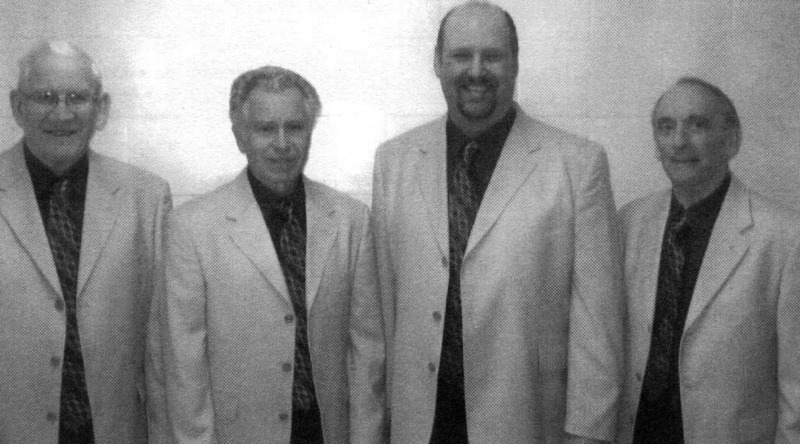 From left to right is Larry Driessens (Tenor), Paul Stuckless (Lead}, Doug Morley (Bass) and John Gough (Baritone). They came in third for their efforts in a list of about eight quartets.